Purpose For the quantitative determination of mouse alpha1-acid glycoprotein (alpha1-AGP) concentrations in serum, plasma, cell culture supernates, tissue homogenates. 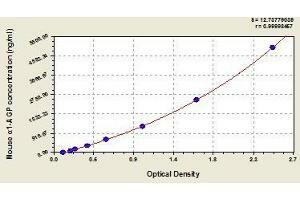 Specificity This assay has high sensitivity and excellent specificity for detection of mouse alpha1-AGP. Protocol This assay employs the quantitative sandwich enzyme immunoassay technique. Antibody specific for alpha1-AGP has been pre-coated onto a microplate. 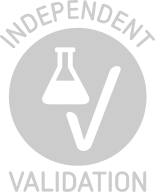 Standards and samples are pipetted into the wells and any alpha1-AGP present is bound by the immobilized antibody. After removing any unbound substances, a biotin-conjugated antibody specific for alpha1-AGP is added to the wells. After washing, avidin conjugated Horseradish Peroxidase (HRP) is added to the wells. Following a wash to remove any unbound avidin-enzyme reagent, a substrate solution is added to the wells and color develops in proportion to the amount of alpha1-AGP bound in the initial step. The color development is stopped and the intensity of the color is measured.